IBM Tivoli Service Request Manager Version 7.1 provides a unified and integrated approach to dealing with all aspects of service requests. This approach enables a “one-touch” IT service experience, backed by an optimized delivery and support process. Tivoli Service Request Manager is a powerful solution that closely aligns IT operations and business operations, improving IT service support and delivery performance. This IBM Redbooks publication provides information that can be used by clients, partners. and IBM field personnel who want to implement ITIL based Service Catalog processes in an enterprise environment. 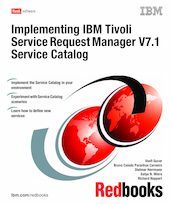 This book is a reference for IT specialists who implement IBM Tivoli Service Request Manager Service Catalog processes in client environments. This book is divided into two parts: Part 1, “ Concepts and components” provides an overview of the IBM Tivoli Service Request Manager Service Catalog functions and components as well as some of the standards that drive Service Catalog development. Part 2, “ Getting started” describes the use of the product to enable readers to create a demonstration or proof-of-concept environment around core product functions.